Erin BrodwinThe testing kit from uBiome. I tried an at-home gut-microbiome test kit made by the Silicon Valley startup uBiome. Since being founded in 2012, uBiome has raised nearly $US110 million and rocketed from a citizen science project to a key player on the life science venture scene. 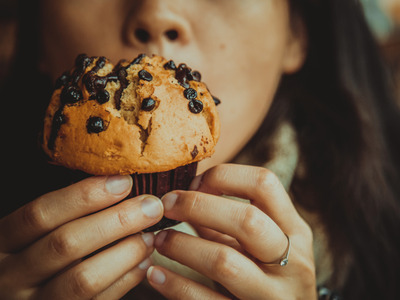 Having experienced minor digestive issues for years, I hoped to learn more about the gut bacteria thought to play a role in everything from our mental health to our ability to process fat and gluten. What I learned about my so-called forgotten organ shocked me. If you’ve ever taken a probiotic, eaten yogurt, or added pickles to your sandwich, you’ve taken a step toward nourishing the vital community of life in your gut collectively known as your microbiome. In recent years, scientists have described the microbiome as the “forgotten organ,” thanks to its emerging role in affecting everything from your mood to your risk of disease. The communities of bacteria living in our guts and elsewhere are thought to influence everything from our mental health to our ability to process fat and gluten. 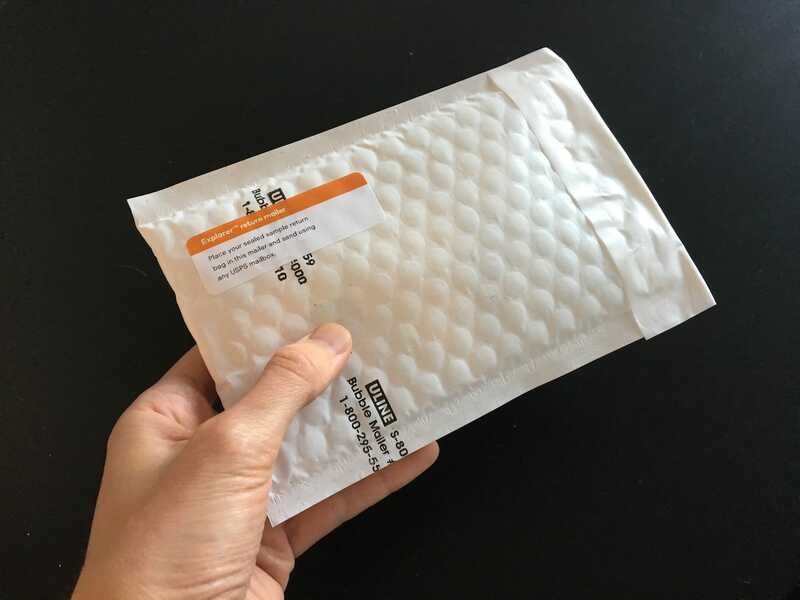 So when I recently got the chance to try a microbiome testing kit at home for free, I took it. Called the “Explorer,” my kit was made by uBiome, a Silicon Valley startup. Since its founding in 2012, uBiome has raised nearly $US110 million in funding and transformed from a citizen science project to a key player on the life science venture scene. Investors call uBiome a game-changer. 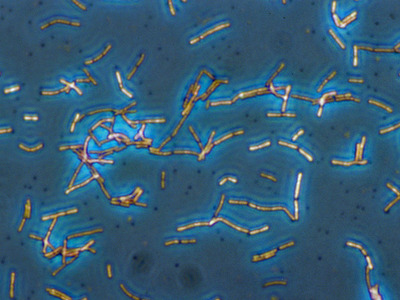 Before the company, we had virtually no central repository for data on the microbiome – data that could ultimately lead to new treatments for deadly diseases. “We will look back and say, ‘I can’t believe we lived our lives without this knowledge,'” Bryan Johnson, the cofounder of a venture firm called OS Fund that led uBiome’s latest funding round, told Business Insider. My uBiome test results came with a significant surprise. Here’s what the experience was like. 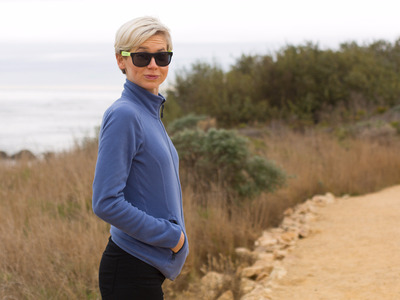 Jessica Richman founded uBiome as a citizen science project in 2012. Since then, her company has quietly risen to prominence. Investors think uBiome’s data could be used to design new drugs for things like autoimmune diseases and cancer. Richman created uBiome with crowdfunding nearly six years ago, in 2012, the same year that a huge government research initiative focused on the microbiome ended. The Human Microbiome Project’s purpose was to study the diverse communities of microbes living in and on our bodies and learn what roles they play in health and disease. But Richman didn’t want to wait years to see those results turn into real products for people. 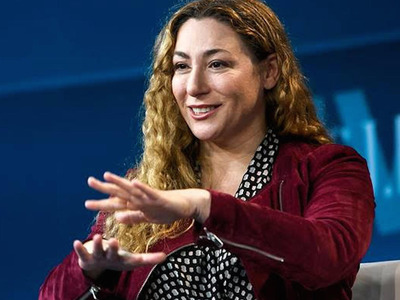 “I couldn’t miss the opportunity to be a part of the beginning of the microbiome revolution,” Richman told Y Combinator, a startup hub that backed uBiome, in 2014. This September, her company raised $US83 million in a funding round that transformed it into a key player on the life science venture scene. Hundreds of thousands of customers have since had their microbiomes sequenced by uBiome researchers, and the company hopes that data can offer the first concrete insights into how microbes affect our health. 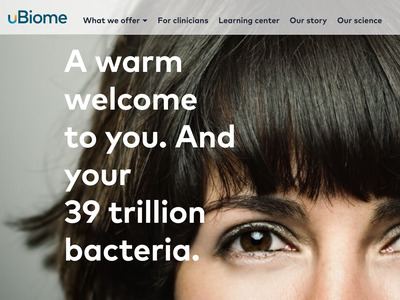 So far, uBiome has collected microbiome samples from 250,000 customers, Richman told Business Insider in September. She aims to reach 1 million samples by 2019, she said. 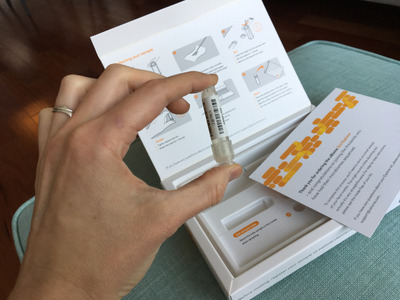 I got a free uBiome test kit at an event organised by the Silicon Valley venture firm Rock Health. At $US89, the kit the most basic version of the three tests uBiome offers. The others require a physician to sign off. 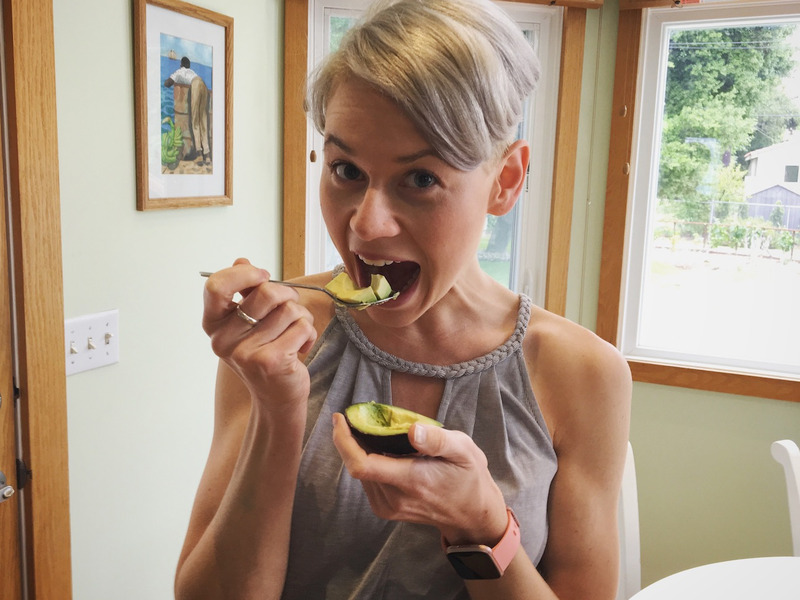 Having experienced mild digestive issues for years, I was excited to learn more about how the bacteria in my gut were faring. Would I learn more about what was causing my occasional bloating, cramps, and indigestion? Or walk away from the test more confused than before? Called the “Explorer,” my test included a set of clear instructions to take my gut sample. But the process wasn’t as easy as merely spitting in a tube. Instead, I had to take a sample from a bowel movement. That involved using the bathroom, rolling one of the swabs included in the kit over my used toilet paper, and spinning the swab around in a small plastic tube. Once the sampling was done, I sealed my tube, mailed it, and registered my kit on uBiome’s website. 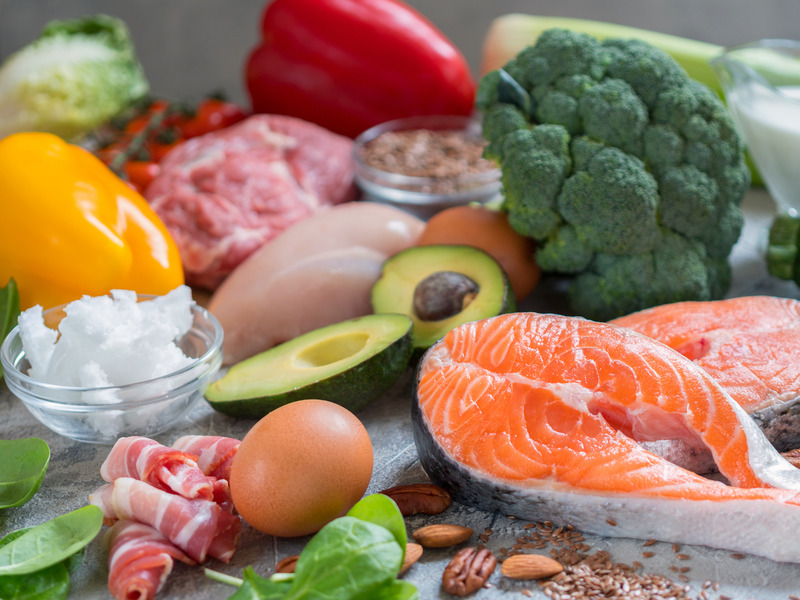 Next, I answered some questions about my diet and lifestyle, designed to help uBiome’s researchers assemble the right health recommendations for me based on my results. One question asked about the foods I’d eaten in the past 24 hours. 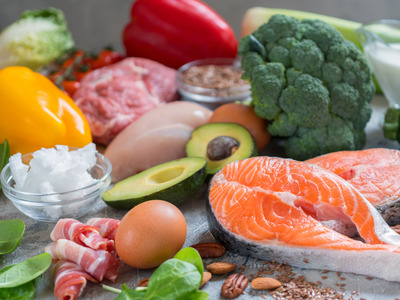 It included some common items thought to affect the makeup of your microbiome, such as red meat, fish, gluten (found in bread, pasta, and baked goods), artificial sweeteners (often found in diet soda, some toothpastes, and protein powders), dairy, and sugar. 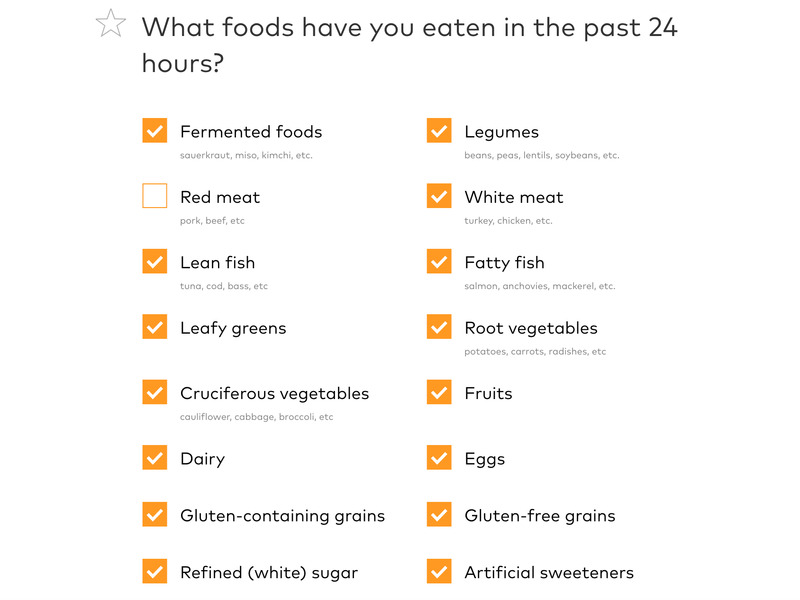 As someone who generally eats anything (except red meat, which I avoid for environmental reasons), I found myself checking nearly all the boxes on some of the questions. When I got my results via email several weeks later, one finding in particular shocked me. The rest of my results seemed pretty normal though. 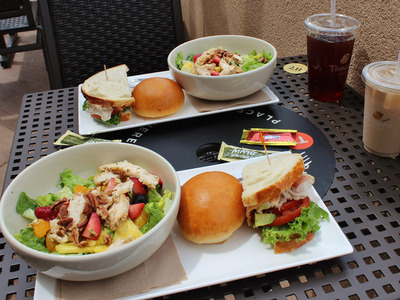 I learned, for example, that I had a healthy portion of the bacteria that help us maintain a healthy weight. 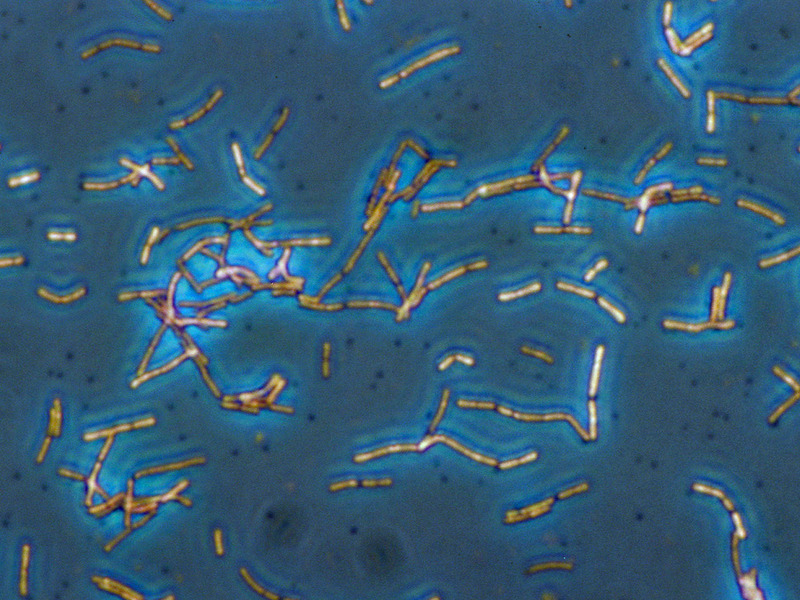 A variety of bacteria have been linked with helping us maintain a healthy weight, including Akkermansia muciniphila, Bifidobacterium, Coprococcus, and Roseburia. 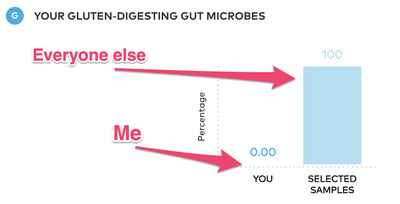 “Research suggests that people who have higher levels of these bacteria are less likely to be overweight or obese,” my uBiome report read. My sample indicated I had slightly higher-than-average levels of all these bacteria compared with others in the uBiome database – good news for me. 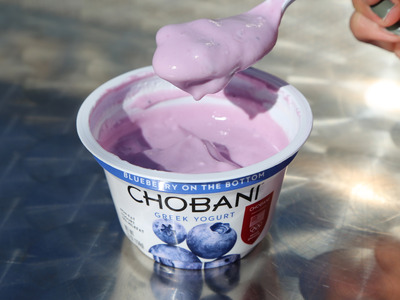 My report also said I had higher-than-average levels of beneficial, or probiotic, bacteria in my gut, such as the kinds found in yogurt and probiotic supplements. 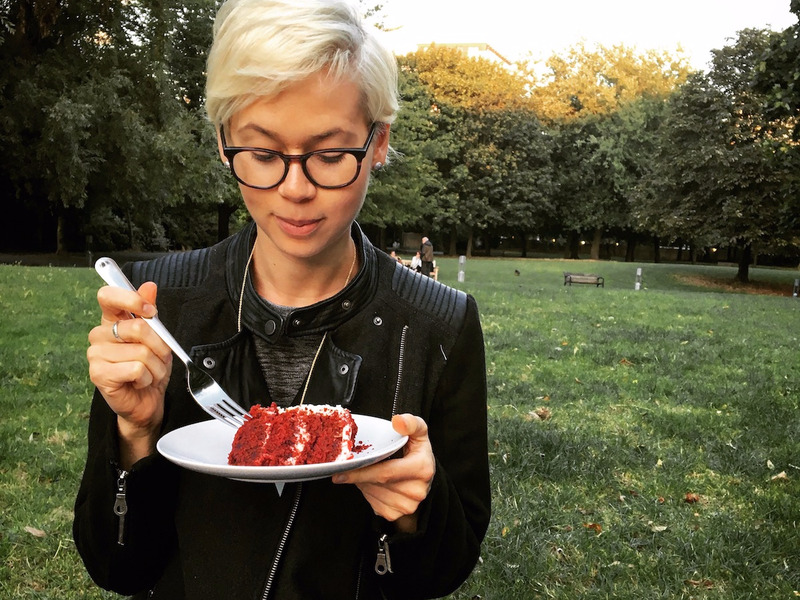 Several years ago, I saw a gastroenterologist about my digestive symptoms. 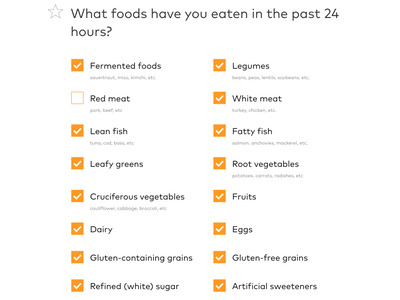 At her recommendation, I started taking a daily probiotic supplement and upped my intake of probiotic foods like yogurt, so this part of my uBiome report didn’t surprise me. I also learned that I have a pretty diverse microbiome that’s rich in different kinds of healthy bacteria. This is a good indication that my gut is doing well overall. But the last result shocked me. It said I had 0% of the bacteria that help our bodies break down gluten, the ingredient found in things like bread, baked goods, pasta, and even some sauces. Concerned, I called Rusha Modi, a gastroenterologist at the University of Southern California, to help walk me through the findings. I’d already been tested for celiac disease, a rare and painful genetic disorder that makes people intolerant to gluten, and come up negative. What did this mean? One important thing to keep in mind about the uBiome results, Modi told me, is that they are comparative, meaning they look at how your gut microbes compare with the rest of the samples it has gotten. 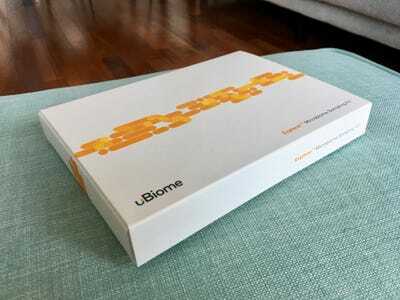 Compared with the hundreds of thousands of other samples in uBiome’s database, my sample lacked all five strains of bacteria known to help digest gluten. It means that while I may not have celiac disease, I could experience negative side effects from eating gluten that other people don’t, such as bloating, gas, and cramps, he said. My results are limited by another significant factor as well, Modi said: They showcase what my gut looked like at only a single point in time. 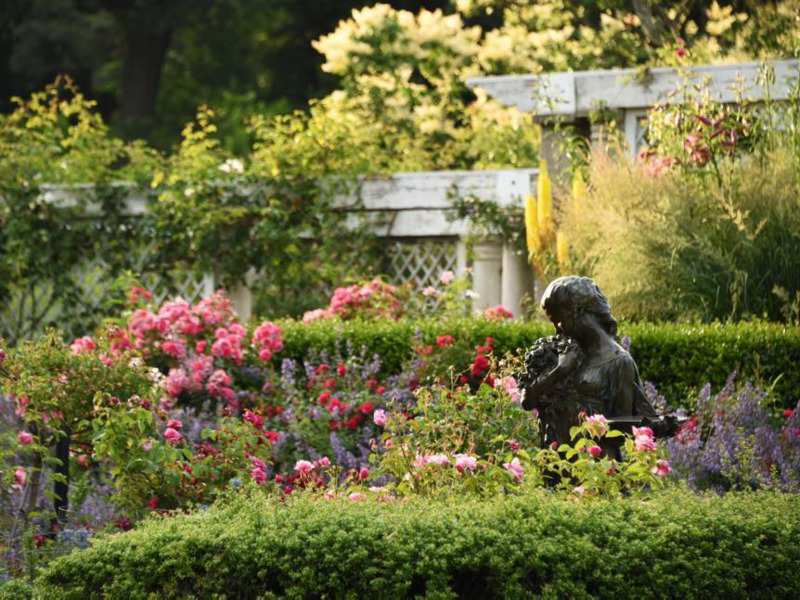 It would be like taking a photo of your garden and sending it to a friend to get their input on how well the garden was doing year-round, Modi said. Everything from seasons to the weather that day (did it rain? was there a drought?) 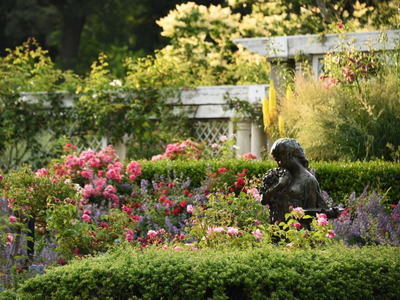 could influence how the garden appeared in the picture. To get a more complete picture of what was really going on in my gut, I’d need either multiple snapshots from many different points in time, or a full workup from a specialist, Modi said. In essence, though my test couldn’t be used as a diagnosis, it could be part of a series of steps I take to learn more about my gut, Modi said. Modi had a recommendation for others who want to take these kinds of tests. “If they’re part of a process that encourages you to learn which parts of your lifestyle may or may not be assisting your health, then by all means – as long as you understand that the science of these tests is still emerging – then I think they’re great,” he said. I’ll keep my finding in mind the next time I choose between a sandwich and a salad. And if I continue to experience issues — especially if they start to interfere with my normal activities — I’ll return to a specialist. In the meantime, I’m excited to contribute to a wealth of data that uBiome is assembling on the microbiome. And in several years, we’ll hopefully have enough of that information to start to reveal meaningful and significant data points that can have real-world applications. “That’s the hope,” Modi said.